Why a radial engine ? The motor, the engine, the gorilla... whatever you want to call it, it's the life of your plane. I've thought about what type of power plant to hang on the front of the Skybolt for some time now. As with anything, there is more than one reason to push me towards one way of doing something as opposed to doing it another way. Everything is gray until the moment of decision then it's a black and white issue.. There was a time that I wanted to hang an IO-540 on the front of the plane I was to build, but that was years ago. Getting back to the original question..... Why a radial engine ? To answer this question we may just need to see what the story is on this BIG OL' ROUND ENGINE that I'll be hanging on the front of my Skybolt ? The radial differs from an inline combustion engine by having the cylinders arranged around a common crankshaft pointing out like spokes on a wheel. The cylinders are connected to the crankshaft with a master-and-articulating-rod assembly. One of the cylinders has a master rod. The master rod has a direct attachment to the crankshaft. The remaining cylinders' connecting rods have pinned attachments to rings around the master rod. Four-stroke radials just about always have an odd number of cylinders so that a consistent every-other-piston firing order can be maintained for smooth running. 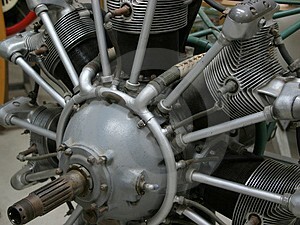 The advantages to using a radial engine on an aircraft are numerous. Because all of the cylinders are in the front of the engine, it is easy to cool them in the airflow. Inline engines require complicated baffles to route the cooling air around and to the back cylinders. Direct air cooling saves weight and is less complex. Radials are also more resistant to damage. When a block cracks on a radial engine, most times that cylinder will be the only one that stops working. Have that happen to an inline and the entire bank of cylinders on the one side seizes up. 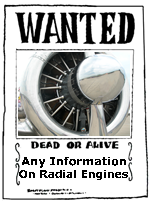 A few items I'd rather not know about, but since I am an informed consumer, I must face the fact that there are a few disadvantages to owning a radial engine. 1. Any supply of compressed air (such as a turbo charger) needs to be piped around the entire engine. Whereas with the inline only two pipes are needed. WAIT... I'm not turbo charging the Gorilla so I can disregard this disadvantage. 2. The "foot print" that it makes going through the air is considerably larger than that of a sleek inline. For low-speed aircraft the drag is pretty insignificant. But at higher speeds, like the ones that the Gorilla will be able to obtain, the drag, if I recall correctly, squares as the speed increases. BUT... back in the late '20's the NACA cowling was designed to reduce the robbing effect of the wind on a naked radial. It looks like I can disregard this disadvantage too. I was reading somewhere that when the NACA cowling was attached to a test plane the top speed went from 190km/hr to 230km/hr. DAMN ! We're talking large speed gains. The NACA cowling was so effective that they went on to use radial engines on many of the fighters and bombers of WWII (looks like I'll be able to put a little WWII flavor in the bipe afterall.) The Navy went on to use it on many of the planes they hangared because of it's simplicity and reliability. 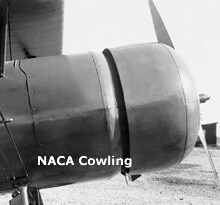 The NACA cowling channels cool air onto the center of the motor, where it is routed across the motor's hottest parts, the cylinder and the cylinder head. In addition, turbulence after the air passes the free-standing cylinders, is greatly reduced. The end result.... drag is reduced by 60%! There you have it. A little about the engine I'll be hanging on the Skybolt. Oh yeah, the original question.... Why a radial engine ? It has nothing to do with reliability or ease of cooling. It's pretty simple... that BIG OL' radial has one helluva sound and it looks so sweeeet on the front of the Skybolt. Gotta get that nostalgic look. Click here to read more about me educating myself about radials.